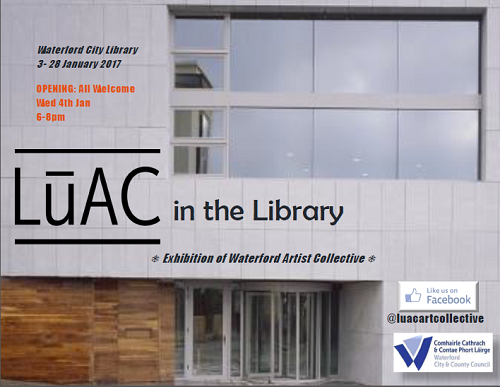 LúAC Artist Collective will be exhibiting their first exhibition of 2017 which will include, painting, photography and sculpture. LúAC is a Waterford based art collective comprising of Ailise O’Neill, Kate O’Beirne, Kevin O’Keeffe, Rosemary Dulson, Aidan Dunne and John Moloney. The exhibition will run until the 28th of Janurary. This entry was posted on December 19, 2016 by waterfordarts in Art, Exhibition, General and tagged art exhibition city library, Arts & Entertainment Waterford, Arts in Waterford, LúAC, Waterford City Council, waterford library.